A major feature of the Ghost Trap DS is the ability to remove impurities even in organic solvents. 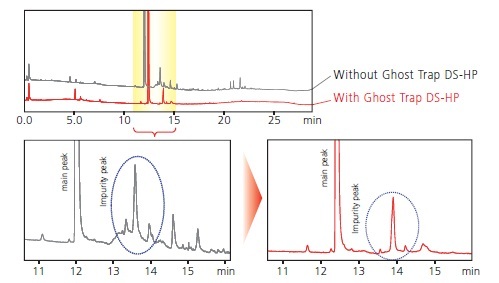 When the Ghost Trap DS is installed between the gradient mixer and autosampler in reversed phase gradient analysis, it can trap impurities from the piping and gradient mixer in addition to those from the mobile phase. 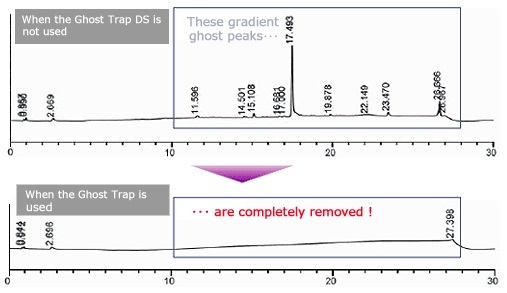 The example below shows that it can effectively trap impurities in mobile phase, when the Ghost Trap DS is installed just downstream of the gradient mixer as displayed in the figure on the right. eliminates the ghost peaks to allow quantitation of the target component. Two Ghost Trap DS models are now available: the cartridge type for superior cost performance and the 100 MPa high-pressure type for use with UHPLC systems. Select the appropriate one for your application. *1	Note that a delay volume equivalent to the internal volume of the product occurs if the product is installed downstream of the gradient mixer or the confluence of two pumps. *	The product service life differs according to analysis conditions, such as the mobile phase used. *	In analysis using an ion-pairing reagent, the ion-pairing reagent may be retained in the product, influencing the retention time and peak shape. *	Before connecting the analytical column, be sure to thoroughly clean the flow path with mobile phase (close to the final concentration for gradient analysis). *	Note that some impurities may not be removed. *	When performing high-pressure analysis exceeding 35 MPa with a UHPLC system, connect the gradient mixer to the Ghost Trap DS-HP with pipe for UHPLC (e.g.228-53137-97).